WEST BRIDGEWATER (November 20, 2017) –Old Colony Hospice has been named one of the Top Places to Work in Massachusetts in the 10th annual employee-based survey project from The Boston Globe. The Top Places to Work 2017 issue will be published online at Globe.com/topplaces on the night of November 16 and in The Boston Globe Magazine on November 19. Old Colony Hospice was ranked fifth in the Small Employers category. As a free-standing, non-profit, Medicare certified, accredited health care organization, we are proud to serve over 55 cities and towns in Southeastern Massachusetts in order to serve our patients and families in whatever setting they consider home. We also are able to offer physical, occupational and speech therapy through relationships with other care providers. Our vision is “To make the end of life care experience better for the people we serve”. 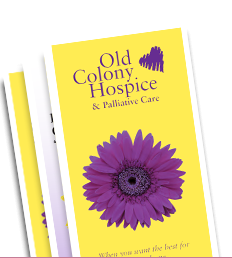 For over 38 years, Old Colony Hospice’s team of registered nurses, social workers, counselors, hospice aides, nutritional consultants and volunteers has been providing caring, compassionate hospice care to patients and their loved ones in partnership with the patient’s primary care physician.